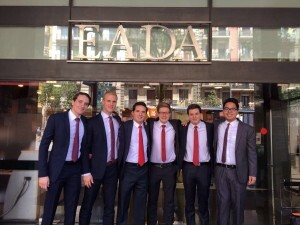 EADA Business School is proud to announce that the Best Final Project Award 2015/2016 Master in Finance class has been awarded to the project “Symrise AG – A Company Valuation”. The winning team was made up of Dorian Berndt (Germany), Enrique De La Paz (Mexico), Michael Hornung-Moser (Germany), Jose Christopher Nicolas (Philippines), Alejandro Francisco Pérez Romero (Mexico), and Jacobo Revah Masliah (Mexico). The team demonstrated a highly professional approach, making them stand out from others. The extensive research and hard work of the winning team conceived a profound knowledge of the topic, and generated insights about the valuation target, its industry and peers. The group used this knowledge as a basis for a very solid valuation through the application of state-of-the-art valuation and risk assessment techniques. The team was particularly skilled at integrating critical thinking into the project, ensuring it did not take on a descriptive format. Finally, the team presented the project in front of the jury and audience in a highly professional manner. Programme director, Nigel Hayes, confirmed that it was one of the best final projects he had seen at EADA. To estimate Symrise’s intrinsic value, the team used a multi-stage discounted free cash flow valuation model, wherein different growth rates were used to model the different stages in the company’s and industry’s life cycle. The team employed different discount rates to better account for the changing risk profile of the company as it transitions through different growth stages. Congratulations to all team members of the “Symrise AG – A Company Valuation” project. EADA’s best final project award for all classes will be handed out on November 18 at the 2016 EADA Annual Meeting.